As Alan Jones continues to descend into his own PR hell, the role social media has played in sending him there cannot be denied. We all know there have been brands, organisations, NFPs and individuals who have used social media as a means to reach their goals (Kony 2012 being a perfect example) and Destroy the Joint is not different. What is different however is the movement’s reach, the speed with which it gained popularity and the impact it has had. I’d like to take a pause, and take a moment away from the media frenzy and melodramatic progress of the Jones issue to explain the impact of social media in the campaign. Most people (except for Alan Jones) will see the irony behind the name “Destroy the Joint”. Taken straight from Jones’s statement about women destroying the joint (AKA female politicians destroying Australia) the movement began as a Twitter hashtag where people could express their thoughts and opinions about this statement. The founder of Destroy the Joint, Jenna Price then created a Facebook page. A month later the page had over 10,000 fans. Five weeks after the page was created it gained a total of 14,684 fans. Destroy the Joint ramped up its campaign against sexism in the Australian society, when the media reported that Alan Jones told a Sydney University Liberal Club that Julia Gillard’s father died of shame because of the lies she told in Parliament. After this comment,focusing on Alan Jones and making him accountable for his words and actions as part of a broader movement to challenge sexism. Twitter was a conversation starter and a discussion forum for anyone with a comment about the issue. Getting the attention of influencers and having them participate in conversations is another way social media can increase its reach and impact – which is exactly what happened when influential women in the media joined the conversation. Influencers such as Mia Freedman (28,794 followers), Catherine Deveny (23,429 followers) and Anne Summers (5,385 followers) had become involved in the conversation. Every tweet they re-tweeted, every response they made about the issue had the potential to be seen by their audience of thousands. Topsy was also used to estimate the activeness of the conversation around Alan Jones. After news about his latest comments hit on 29 September, Topsy estimated over 1000 mentions of the issue per day. Apart from Destroy the Joint, other campaigns have sprung up against Alan Jones. Political science and international relations student Nic Lochner created Sack Alan Jones Facebook page which wields overwhelming popularity with more than 17,000 fans. Over 114,000 people have signed the Change.org petition he also created asking 2GB and its advertisers to “cease association with Alan Jones” . The considerable number of signatures provided evidence that a significant number of people were concerned about the offensive comments made by Jones and were willing to put that in writing. When ABC’s AM show asked Destroy the Joint creator Jenna Price to speak about the campaign amongst Jones’s allegations that he was cyber bullied. 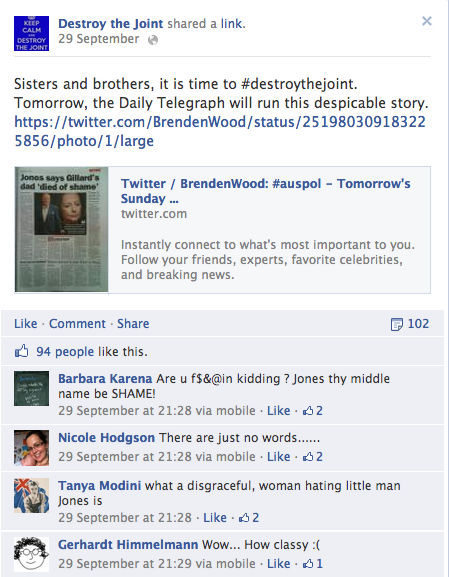 2GB also interviewed Jenna Price on 8 October to confront her about the public backlash inspired by Destroy the Joint. It was a clear sign that social media has done enough damage to be noticed. Other media channels such as Women’s Agenda and Leading Company spoke about social media siting it as one of the reasons advertisers had pulled out from the show. What sets this campaign aside is its ability to target and to attract the right audience and to act as a focused and united front. 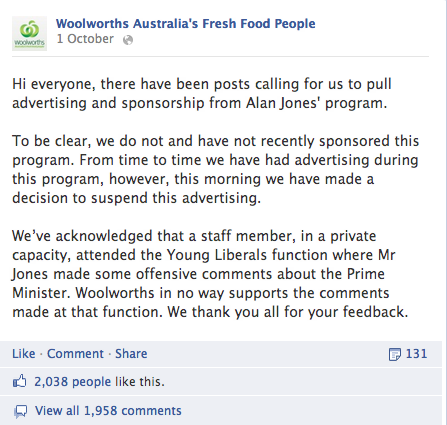 You could almost call it a localised and targeted social media campaign – a campaign that managed to connect with the relevant influencers, inspired the public to act and brought the Alan Jones issue to the attention of media and government. As the result of the pressure applied to advertisers through social media Macquarie Radio Network has suspended all advertising from Alan Jones’s show. 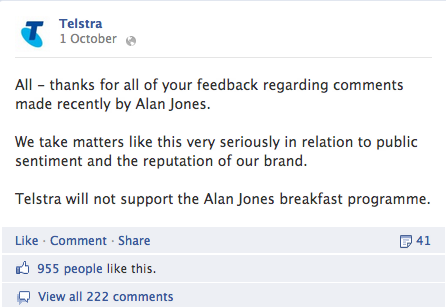 Mercedes Benz went as far as confiscating Alan Jones’s sponsored car to dissociate themselves from the radio host. Awareness of the Alan Jones issue sky rocketed causing the public, the media, politicians to question and debate attitudes towards women in the Australian society. I think this might be a glimpse of what we will see in the future – the public using social media as the weapon of choice when it comes to making their voices heard about particular issues. 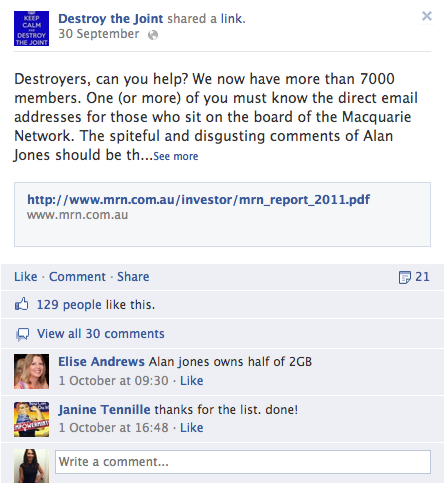 However it remains to be seen if the power of the people in this case is stronger than the power of Alan Jones.